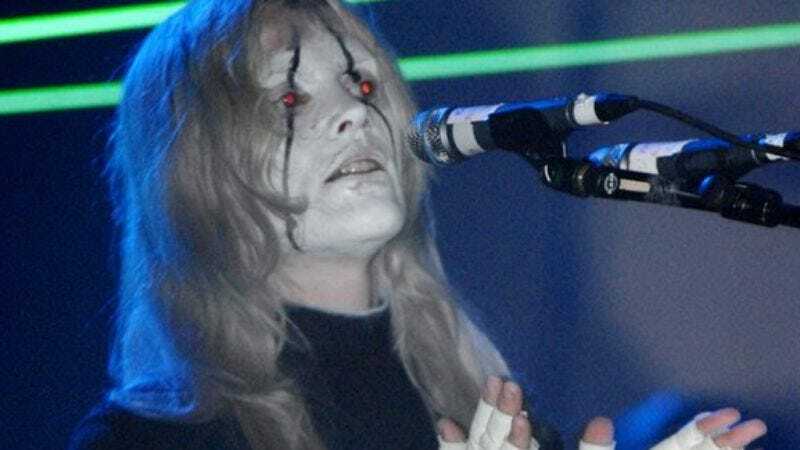 Fever Ray inhabits an incalculably black landscape populated by pagan saints, tribal warlords, and wanderers wearing corpse paint. This is how the solo output of Karin Dreijer Andersson (she also of Sweden’s mighty The Knife) has been crafted, and it’s no wonder: Andersson’s music dwells in a haunting fog of dark synthesizers and deep percussion, and she refers to her differently augmented on-record voices as “my bunch of pitched friends”—individual characters with separate weird inclinations and emotions. Behind Fever Ray’s show tonight at Metro, The A.V. Club spoke with Andersson about her oddly inviting and wholly inimitable world. The A.V. Club: The Fever Ray album has a very visual quality to it, as if the sounds convey some sort of spatial placement. Is that something you seek to communicate on record? Karin Dreijer Andersson: Yes. When I start to write and record a track, I always think about where it is supposed to take place, what kind of room that is, and what kind of atmosphere it should have. Also how it should be performed, and by what kind of musicians or vocalists. I work in a very theatrically minded sort of way. AVC: You’ve put together a very theatrical performance—including a full band, costumes and visuals. What were you hoping to achieve or represent in working with artist Andreas Nilsson to design the show? KDA: It was a lot of experimenting. I worked very closely with Andreas, and we’d discussed a certain kind of character inspired by pictures we’d gathered of early Europeans, Native Americans, and Inuit people. We took details from very primitive cultures in order to create something that would go with the sound of the music. We work a lot with the idea of a ritual going on, so we’ll start by filling the room with smoke and build from there. Of course, sometimes it doesn’t work, like when we play outdoors at festivals and all the smoke blows away. Then it’s just us standing there looking stupid. AVC: Do you like that element of chance—that something could go wrong? KDA: Yes. What we do is a thin line between an elementary-school Christmas play and something very strange where you don’t really know what’s going on at all. There are so many things that must happen for it to go well—the smoke, the lights, the expensive high-tech lasers that we use. It’s sometimes a hassle, but I do like all those risk elements. AVC: Your work is often described as dark or macabre. Do you feel that way about it? KDA: No, I don’t see it as dark. It’s trying to find a tempo that’s primal and quite slow and tentative. Sometimes maybe the lyrics are about things that are, well, not the brightest, but I have been working with this outlook for such a long time that it’s not dark to me anymore. It’s just something that you work through and in the end, it’s a lot of happiness. AVC: What attracts you to that more primal imagery that you mentioned? AVC: Something that you can believe in as well? KDA: Or just a room where you can listen to music and not be so influenced by anything too modern. I think that’s part of what attracts us to working with smoke—it is a really good way of signifying starting from scratch. AVC: You’ve released four distinctive videos so far, each by a different director. What do you look for in choosing a director? KDA: I tried to find directors that have a very clear way of telling stories themselves. I wanted to see their individual interpretations of the music without me interfering too much. I didn’t want to have to tell them too much. AVC: The “Triangle Walks” video features several different faces singing different parts of your song. Are these characters close to those you imagined while recording? KDA: Most of the people in that video are actually my live band, so no. [Laughs.] But for me, those characters were never so physical. It’s more about emotional territory—like someone who feels or thinks in a certain way, or who screams or whispers when she speaks. AVC: You’ve mentioned that part of your reason for doing Fever Ray was to discover what kind of music you would make without outside influence. Do you have a better understanding of that now? KDA: Yeah, but I realize it changes very fast. It’s been a year since we finished mixing the album, and I’m already somewhere else musically. It was a very good experience to work on my own again, to discover that I haven’t forgotten what it’s like, but I don’t really know what will happen next time I record.